"We welcome others joining. We welcome the activity that's in the space. We think it's exciting. It's actually change that we are embracing," said Don Butler, Ford's executive director for Connected Vehicles and Serivces, in an exchange with TrustedReviews. "So I think Apple can do it. I think Google can do it." Butler suggested that the most likely scenario for the industry is a range of partnerships with companies offering specific skill sets that others lack. That comment is presumably a reference to the fact that while Apple and Google may be better at software than Ford, they lack experience in designing vehicles, and don't have the mass manufacturing infrastructure for anything they'd like to build. Rumors have claimed that Ford is partnering with Google on a self-driving car, possibly with the goal of setting up a completely automated ridesharing service. Such a service might be app-based like Uber or Lyft, but would eliminate the greatest business expense, which is paying human drivers a reasonable wage. Apple's exact interests are nebulous, but the company is thought to be aiming at shipping an electric car for sale sometime in 2019 or 2020. The first model may or may not be self-driving, in fact, though Apple is at least believed to be working on the technology. Looks like Don Butler wants a new job with Apple or Google. On automobile related; just saw a TV commercial last night for the new Chevy Malibu that featured Carplay in the ad. Ford's actually pretty far ahead in the tech game, and they have some of the best engineers in the world. They just managed to pull off a complete swap to building F-150's out of aluminium in a year, which is no mean feat. Change is what the industry needs. The big 3 pissed away 2 decades trying to be greedy meanwhile no innovation. Newcomers will bring innovation and also bring in manufacturing that makes sense for the US. Ford is still too heavy and not geared properly to be effective in the long run. It is time to shake things up. I respect Ford for refusing the illegal government bailouts during the crash of '08. incidentally, AAPL stock is getting killed again today. I have a large buy waiting at $82, which the stock absolutely may hit soon at this rate. It's as if the company was going out of business with the stock performance... Has Sog committed suicide yet? On a definitely related note did anyone else see the report out today with stats showing Americans becoming less and less interested in driving and/or owning a vehicle? It particularly applies to teens and the 20 somethings apparently. Every year since 2008 the percentage of driving age adults with driver's licenses has dropped. Millennials are such self-involved and codependent deadbeats I don't find this at all surprising. It looks like the biggest car companies are recognizing that Americans are taking a lesser interest in driving and car ownership with recent discussions and investments with ride-sharing services like Uber and Lyft. In fact after investing in Lyft very recently GM announced today that it was buying the remnants of Sidecar, yet another ride-sharing service. The noise in the room is whispers that Uber has something major in the works. The unemployment rates may have something to do with that. If you're living with your parents and have no job + six figures in student loan debt, a car is the last things on your mind. Using your rainy day fund to buy 10 shares of Apple stock is not a "large buy". I recommend you take out a loan of $100,000 and buy yourself 1000 (or more) shares of Apple stock at that price and hold it for the long-term. Anything less is kiddy trading and a joke not worth losing money over. Who said anything about buying 10 shares? Did I forget to mention that buying anything less than 1000 shares at that price is a waste and a risk not worth taking? 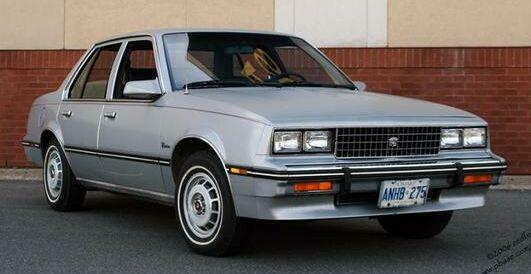 Behold the 1982 Cadillac Cimaron - A Chevy Cavalier with the Cadillac name patched on it. The peak of industry greediness. You didn't forget to mention, but why the "10 shares" assumption? I can see this for urban areas; not so much for suburbs or rural areas. But given that, most of the U.S. population is living in urban areas, even in my home state of Nevada. The auto industry is wise to shift to a different ownership model. Gas is cheaper if you account for inflation than in the 1970s or 1980s. Cars last a lot longer than and are not proportionally more expensive than in the 1970s and 1980s. I'd say they're actually cheaper if you consider the abysmal quality of used cars in the 1970s and 1980s. I think it's clear it is just changing priorities and interests. Right... Why look at actual Millennials when I can just imagine them like I want them to be in my head. Every year since 2008 the percentage of driving age adults with driver's licenses has dropped. What do they use for ID? Can they just get a state ID card to prove they are old enough to buy beer? I don't think you know much about Ford. They are one of the leaders in technology and advancements in the moving assembly line. Ford is perfectly geared for the long run. You should look up the new technology Ford is working on called F3T. Besides F3T, Ford is working on so many new technologies right now. Ford has a special team working around the world on projects that are more than just auto related. Ford opened a new research facility in Palo Alto last year and hired former Apple engineers. Ford is also collaborating with Stanford in the development of autonomous vehicle technology.